ESSEX, Vt. — One of the Green Mountain State’s late-summer traditions, the Travis Roy Foundation WIFFLE Ball Tournament will be held for the 16th year on August 11-13, 2017 (Friday-Sunday) in Essex, Vermont. With another expanded field and another challenging fundraising goal, the now-34-team ‘Best Weekend of The Year’ tourney will be held again at Pat and Beth O’Connor’s three backyard fields, Little Fenway, Little Wrigley and Little Field of Dreams. The event is open to the public and admission is free. All funds go to the Travis Roy Foundation that benefits and creates awareness for people with spinal cord injuries, and is named after the former Boston University men’s hockey player who resides with his family in nearby Mallets Bay in Colchester each summer. A year ago the backyard tournament shattered the previous single-year fundraising record bringing in a staggering $615,024, to lift the 15-year total over the four-million dollar amount. It was the third time in the last four years the weekend has raised over a half-million dollars. The lifeblood of the Travis Roy Foundation has been the generosity of individuals, corporations and foundations across North America, and this event has become the foundation’s largest annual fundraiser. This generosity has made an immediate impact on the lives of many individuals. Since the 2016 tourney, the foundation has issued close to $200,000 in research grants to make progress in finding a cure as well as issuing close to $150,000 in grants to enhance the lives of people and families affected by spinal cord injuries. 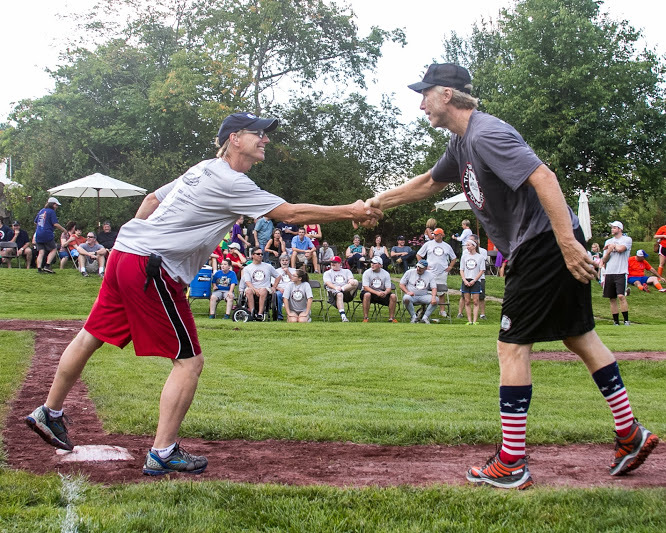 The tournament opens on Friday afternoon, August 11 with the opening ceremonies at Little Fenway featuring the annual Celebrities-Sponsor game at 5:30 p.m. along with opening game action on all three fields. As well as a full slate of games, Saturday features the annual Money Count Ceremony at 1 p.m. and the tourney runs through the championship game on Sunday afternoon, August 13. The 34 teams are filled for the tourney but in addition to the action on the field, many other events will be held throughout the weekend including a silent auction, many raffles, great food, a kid’s WIFFLE ball game, the Scooter’s Pretzel’s Home Run Derby, and a special kid’s tent Saturday that features face painting, games and other contests. The complete schedule and a full list of celebrities will be announced prior to the tournament. The Essex-based Buckners captured last year’s championship, their first, by defeating the Boston Terriers in a thrilling title game. They became the first Vermont team since 2007 to win the crown. For the sixth straight year tournament action will be streamed live on the internet on the Pack Network. The opening ceremonies and celebrity-sponsor game, Saturday’s money count ceremony and Sunday’s title game will be aired live as well as game action from Little Fenway and live look-ins from the other fields throughout the weekend. The ’Fantasy WIFFLE’ fundraiser returns for its second year. Fantasy WIFFLE is where fans and supporters can create their own ‘fantasy’ WIFFLE ball team based on participants in the 2017 TRF WIFFLE ball tournament. All funds go to the tournament and the winner of 2017 Fantasy WIFFLE will win a great prize courtesy of JetBlue Airways. Log on to www.fantasywiffle.com for more details and to enter your team.